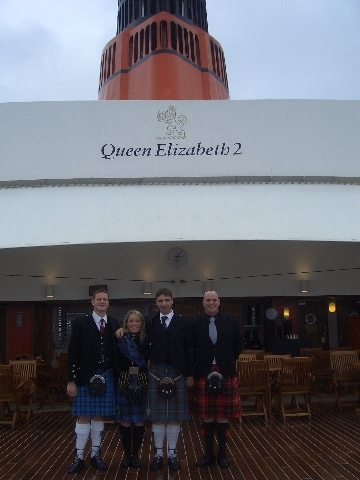 I was completely honoured to have been asked to pipe for the world's most famous ocean liner, the iconic 'Queen Elizabeth 2' (QE2), on 7th October 2008 at South Queensferry, Scotland! I arranged a quartet to perform as the 'QE2' arrived in the Firth of Forth just under the Forth Rail Bridge (Glyn, Camay and I on pipes and Billy on snare drum!! 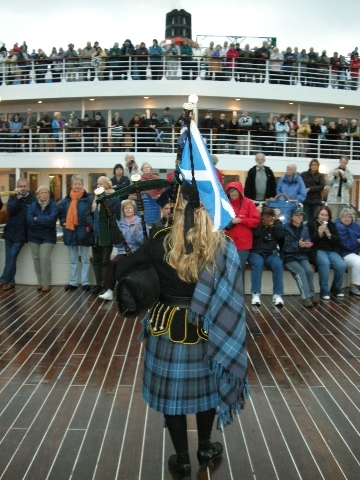 ), performing a selection of well-known Scottish tunes as passengers disembarked. 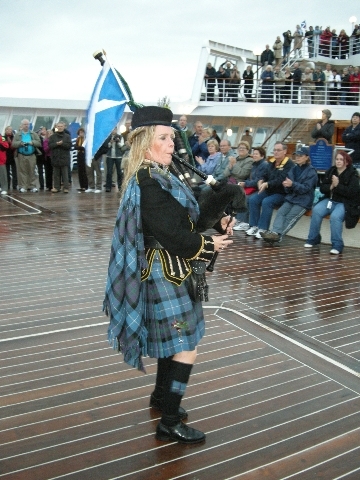 We then played again as VIP's were welcomed on board for lunch and were also delighted to enjoy lunch on board the QE2. Piping for the arrival of the QE2 to the Firth of Forth! Built by John Brown Shipyard of Clydebank and launched on September 20, 1967, by Her Majesty Queen Elizabeth II, the QE2 has been the flagship of the Cunard line for 40 years!! This will be the last time she will be in Scottish waters - at the end of the year, just after celebrating her 40th birthday in 2007, the QE2 will be decommisioned and take up her new position as a floating luxury cruiseliner at the world's largest man-made island, The Palm Jumeriah, Dubai! 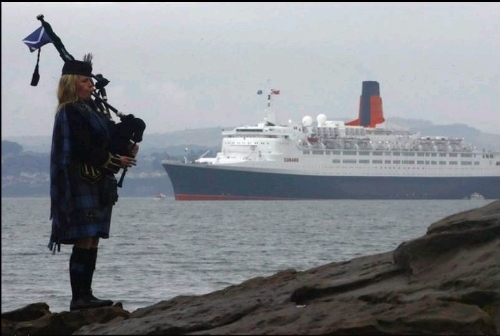 The last piper to play on board the QE2 in Scottish waters! 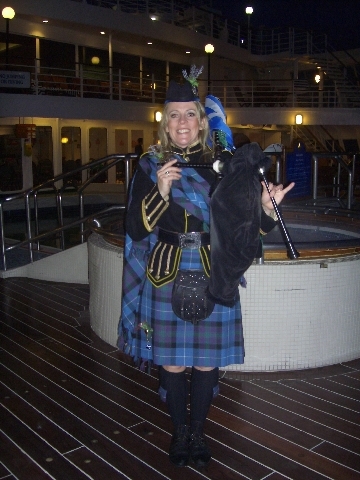 As all the passengers wave goodbye to Scotland on 7th October 2008! Piping for all the passengers on the top deck of the QE2. The QE2 will be decomissioned at the end of the year and will be transformed into a luxury floating hotel in Dubai. Relaxing after playing for 4 hours! 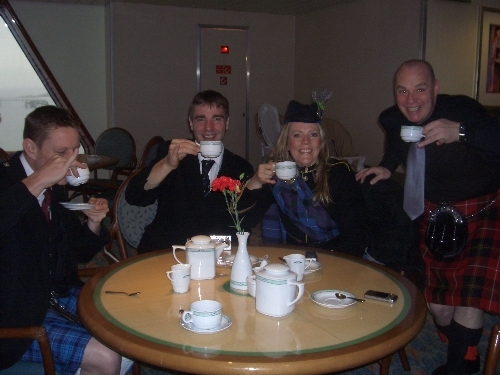 And here we are enjoying a cup of tea on board the QE2. We had a fantastic time. My fellow pipers and drummers then left at 4.30pm and I was delighted to have been asked to stay on board for the evening and perform as the QE2 set sail from Scottish waters for the very last time! Enjoying a cuppa after lunch! Having played in rainy South Queensferry for 4 hours! Perfect! 'The 3 pipers' Glyn, Camay and I, enjoying our gorgeous Scottish weather!! 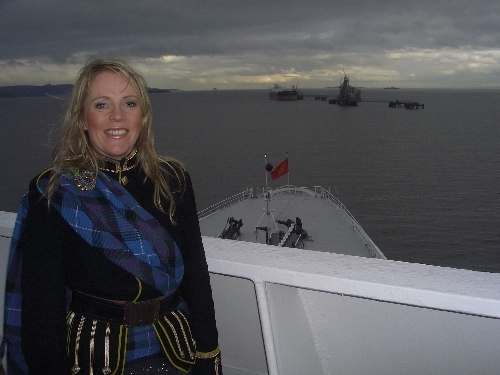 What better place to relax - on board the QE2 with a spectacular view of the Forth Rail and Road Bridges!! The passengers were reminiscing about previous times on board the QE2. The Forth Rail and Road Bridges!! This was the closest I could get to doing my 'Kate Winslet' on the QE2!!!!! 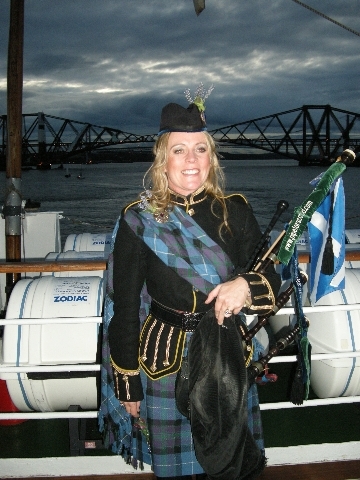 As she sets sail doon the Forth! PIping in front of the Jacuzzi! The QE2 is completely stunning! Later in the evening, I performed in the 'Grand Lounge'. The pipes went down a storm!! The audience was fantastic and enjoyed singing along to 'Auld Lang Syne'. All passengers and crew made me extremely welcome!! The hospitality I received was outstanding and I would like to thank everyone on board, crew and passengers, for allowing me to take back some wonderful memories of my time on board the QE2!! 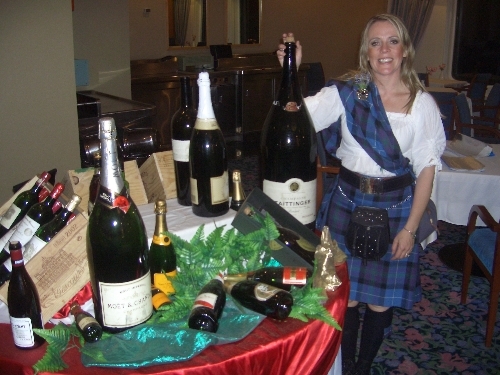 Fine selection of champagne on board!! Only the best for the QE2!! 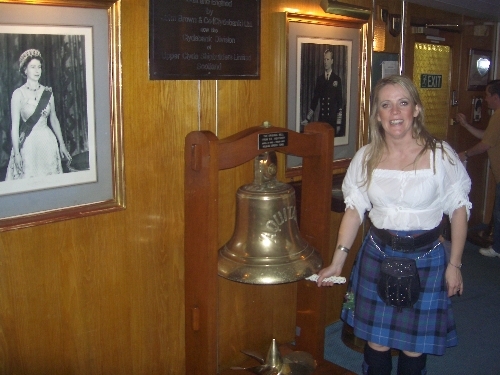 Ringing the bell from RMS Aquitania whilst on my tour of the QE2! In her 36 years of service, the RMS Aquitania survived military duty in both World wars and was returned to passenger service after each war. RMS Aquitania was also a Cunard Line ocean liner that was built by John Brown and Company Shipyard near Clydebank, Scotland. She was launched in 1913 and held the record for the longest service career of any 20th century express liner until 2004, when the QUEEN ELIZABETH 2 (ultimate career service of 40 years) became the longest-serving liner!! Well done QE2, I think you have earned your retirement. 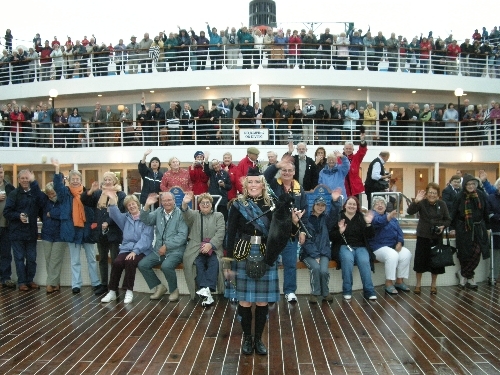 Goodbye Scotland from all on board the World's most famous ocean liner, the QE2! 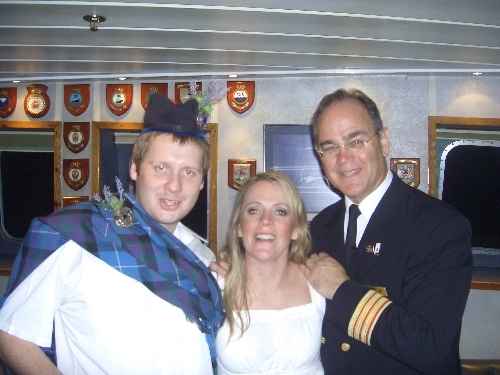 Pictured here on my right with Dr. Martin Carroll, Last Principal Medical Officer, RMS Queen Elizabeth 2, who very kindly took me on a guided tour of the QE2 and introduced me to members of the crew!!! 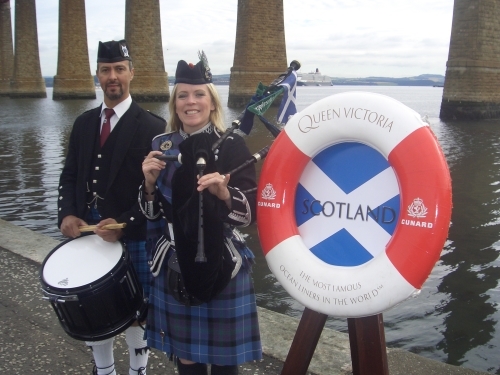 Piping for the arrival of Cundard's 'QUEEN VICTORIA' at South Queensferry, Scotland, on 30 July 2010. Pictured here with Snare Drummer, Marcos Watt! As we welcome all passengers to Scotland!